I was on a road trip last week to visit a satellite factory and it was past noon that we decided to pull alongside the first restaurant we could find en route. Spitlanders are known to have their meals rather early (12 noon for lunch and around 5:30 to 6pm for dinner) and so by the time we found a restaurant at around 1pm, the place was deserted as the lunch crowd had already come and gone. Actually, it is not bad considering that fact that we would be able to eat in peace as Cant0n Spitlanders are among the loudest people on Planet Earth. If aliens in outer space were to be on the lookout using an audio telescope like what our scientists are doing listening for signs of E.T., I'd bet you they be hearing Cant0nese chatter. When JayWalk is bored, he gets very very observant and can write an entire blog entry over the most mundane things. This is one of them and worse, it's a TWO-PARTER! Our dishes arrived slightly later, presumably the proprietress had to drag the chef back into the kitchen from his after-lunch siesta. Everything seemed pretty ordinary except for this one particular dish which I decided to take a picture and write a story about it. From the looks of it, it is pretty easy to guess that the dish was 铁板牛肉 or more Ah-Beng-ly known as Metal Plate Cow Meat. Problem that when we took our first mouthful, nobody on the table could tell for sure if what we ate was beef. It wasn't bad per se but just that we couldn't tell if it were beef. We were not at all worried for after all, this is Spitland and we have all eaten weirder things at some point. Before we know it, this became the center conversation topic of lunch and we concluded that we did not order 铁板 + 牛肉. 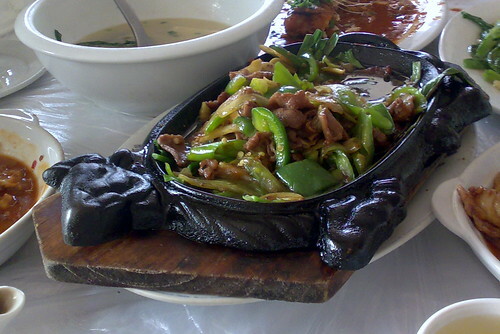 Instead 铁板牛 + 肉 judging from the iron skillet shaped into a cow and the mystery meat on it. However, it is still very much Metal Plate Cow Meat in Beng-speak. No change there. So yeah, it was a boring lunch but stay tuned for tomorrow for something that I spied with my little eyes halfway through lunch. 2am in the morning, rushing my SIP report, very hungry, I saw your metal plate cow meat, and I don't think I'd care if its really cow or not if its right in front of me now... hahahaha!